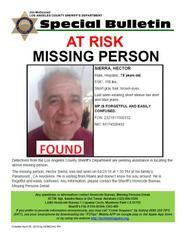 Los Angeles County Sheriff's Department Missing Person Unit is advising At-Risk Missing Person Hector Sierra has been found safe and returned to his family residence in Paramont. Thank you to everyone who helped search for Mr. Sierra. Your efforts in these matters are always appreciated. Los Angeles County Sheriff’s Department’s Missing Persons Unit detectives are seeking the public’s assistance in locating Hector Sierra. 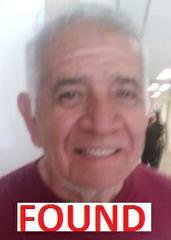 He is a 75 year-old male Hispanic who was last seen at his family’s residence in Paramount on Wednesday, April 25, 2018 at 1:30 p.m.
Mr. Sierra is described as 5’08” tall, 150lbs., short gray hair, and brown eyes. He was last seen wearing a short sleeve tan shirt and jeans. Hector Sierra is here from Miami, Florida and does not know his way around. He is forgetful and easily confused. His family is very concerned, and asking for the public’s assistance in located her/him.